Is Neoprene Better Than Vinyl for Dumbbells? Dumbbells are made of cast iron but many manufacturers cover the iron with other materials to improve the look and feel of the dumbbells. Neoprene and vinyl are two of the most common dumbbell cover materials. Although different in many respects, neoprene has the advantage of being less slippery when your hands become sweaty. Neoprene dumbbells have a soft, smooth coating with a matte finish. Although the material is smooth, it is not slick and is easy to grip. Vinyl dumbbells have a soft, smooth coating with a glossy finish. Vinyl is smooth and can be slick if wet, but if kept dry, it has an almost sticky quality that makes the dumbbell easy to grip. The vinyl covering on a dumbbell is more prone to splitting and cracking then neoprene covering. Vinyl and neoprene dumbbells are often used for aerobic classes. They are usually available in one pound increments up to 10 pounds. Most neoprene or vinyl dumbbells don't go above 15 pounds. The vinyl or neoprene coating is colored, making these dumbbells more aesthetically pleasing than standard hex dumbbells. The coating provides a protective barrier so vinyl and neoprene dumbbells don't damage the wood floors that are typically found in aerobic studios. Vinyl and neoprene dumbbells are not designed for heavy, intense strength-training sessions. The dumbbells do not go up high enough in weight. They are meant to be used for light training in a group exercise or rehabilitation environment. 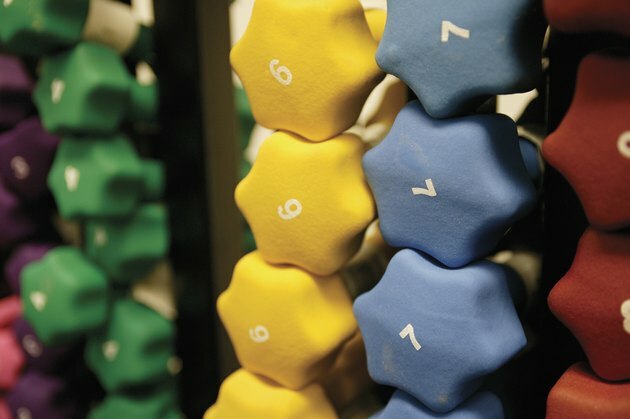 Although vinyl and neoprene dumbbells are color-coded by weight, the coding is not consistent among brands. One brand may color its five pound dumbbells black, but another brand may color its five pound dumbbells red. Neoprene and vinyl dumbbells have similar price points, costing between $4 and $40 per pair, depending on the weight. Vinyl is a synthetic plastic that is often used as a substitute for leather. In its rigid state, vinyl is known as PVC and is used to make pipes and water bottles. In its flexible state, vinyl is used in many consumer products, such as flooring, clothing and toys. Neoprene is a synthetic rubber. It resists degradation, damage and abrasions. Neoprene has water-resistant properties and is used for wetsuits and scuba diving products.